As much as I love to get lost for hours in a sewing project, it’s always nice to have a few quick backups. This 30-minute pleated dress only requires knit fabric and an existing shirt for a pattern. All those who are a bit weary of knits, this is a great beginner project for you. You can also find helpful tips in our How to Sew Knit Fabrics post. Jessica from Me Sew Crazy brings us this cute tutorial today. You may remember her How to Sew a Raincoat tutorial from a few weeks back. 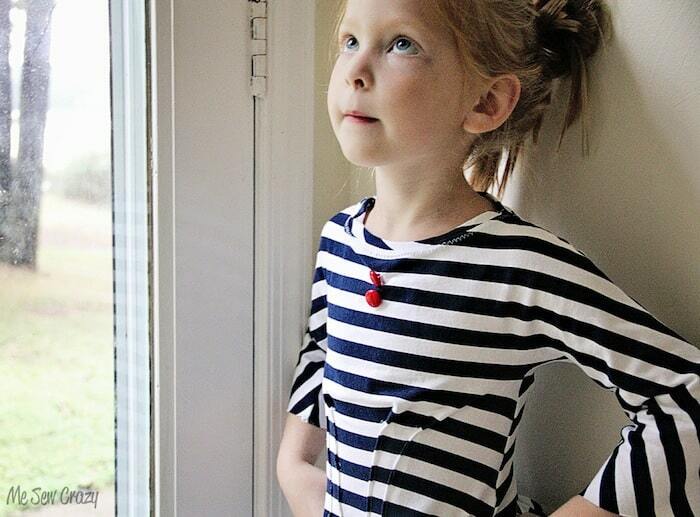 Head on over to Me Sew Crazy to check out Jessica’s Pleated Knot Tunic for mamas. Her Love on the Line Piping Embellishment would be perfect for Valentine’s Day. If you’re on the hunt for more patterns and tutorial, take a peek at the SewSet search engine she created. I have been having fun sewing a little bit for myself here and there lately, but I miss sewing for my kiddos. They are truly my passion when it comes to picking out fabrics and figuring out what to do with them. So it was with great joy that I decided to drop all of my MUST-DO’s yesterday, and do some fun & quick sewing for the littlest loves of my life. 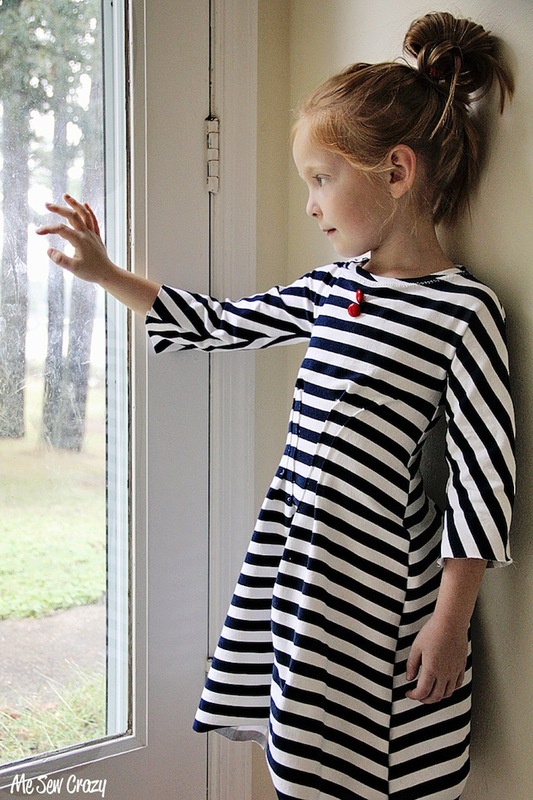 After switching out all of my kids closets from summer to fall clothes this past weekend, I realized both of my little girlies were in need of some long sleeve dresses! And that is how we got started with the cute little french number. 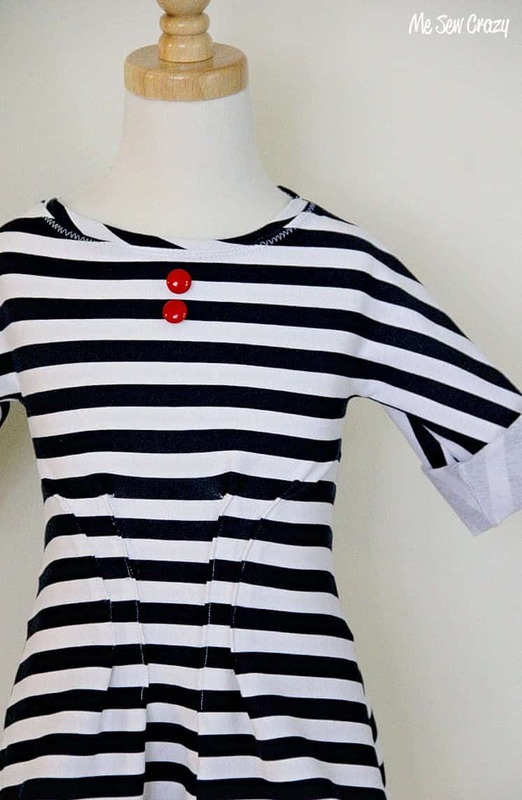 Its casual, cute, easy to sew, and classy all at the same time. Gotta love that! Not being in the mood to mess with elastic yesterday, I decided to take in the waist of this knit dress with fun pleats instead. And I love how it turned out. You will need to use knit fabric for this dress, and be sure it stretches left to right. 1. 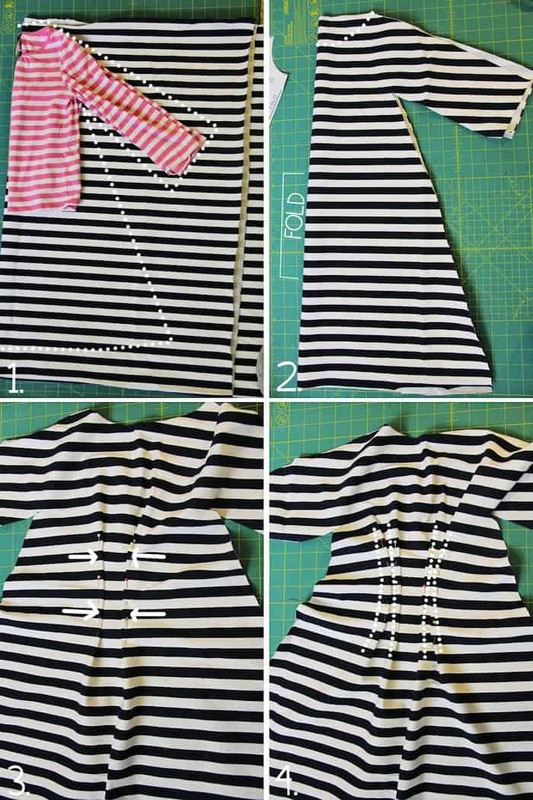 Trace around a shirt that fits well (on the fold), to get the body of the dress. Really bell out at the sides, we want to be able to take that in later with the pleating. Cut (2), 1 for front, 1 for back. 2. Alter front pattern piece neckline. 3. In the middle of the dress, where your child’s waistline is, gently fold in towards the center the fabric and pin. Repeat for both sides, creating equal pleats. 4. 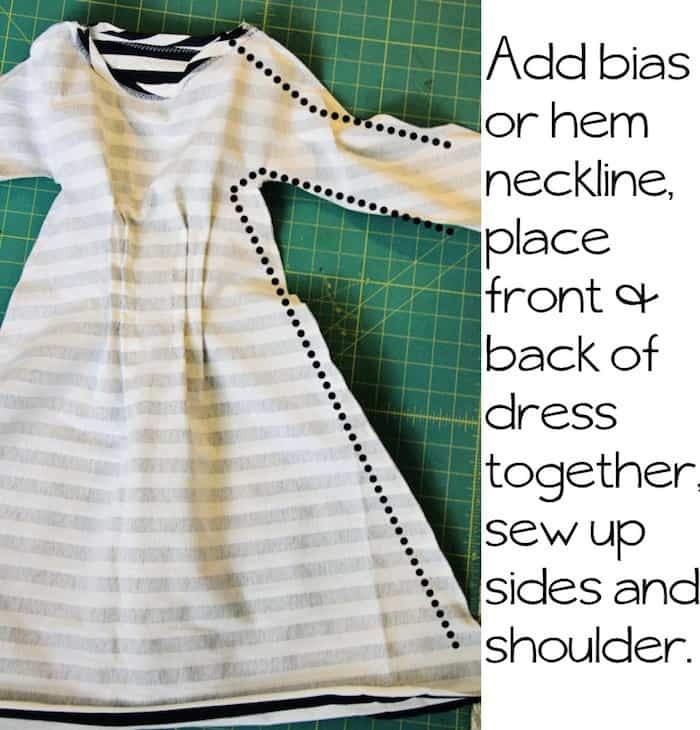 Repeat for a second or third line of pleats on each side, until you get the dress waist to approximately the same size as your child’s waist diameter. Repeat for the back of your dress. Now its just sewing the dress together and finishing off all of the raw edges as you please. I added the two little buttons on the top of the dress to give it an extra little punch. Want to do this dress in regular cotton or other non-stretchy fabric? Just be sure to add a button placket or zipper along the back or side seam – and the technique will work just as well. And there you have it, my 30-minute contribution to Kids Week Clothing Challenge at Elsie Marley. 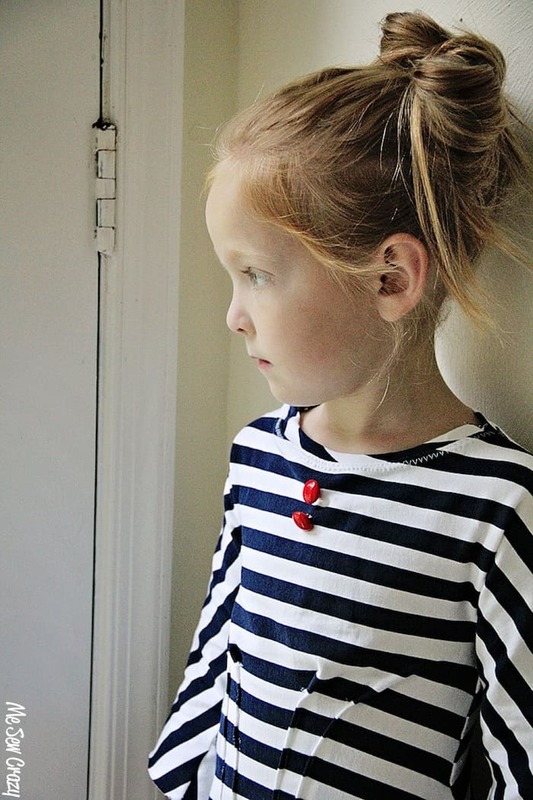 Trying to fit my inventions on my 2 year old daughter has been a nightmare– do you think a dress form would help? Where did you get your dress form? Any recommendations? Thanks so much for sharing this great, simple pattern. I have just finished mine and it looks fantastic, although I admit it took me a little longer than 30 minutes! This is adorable! I am just a little confused on how to sew the pleats. never done this before. do I just sew right on top? That’s how I did mine. Fold however wide you would like them and sew on top. Such a flattering, feminine dress pattern. Love it.